Wedding planning comes with so many choices. From decor and food to floral and music, the decisions are never-ending and can become so overwhelming. Once the end of wedding planning is in sight, we find that many couples throw caution to the wind and choose not to complete final tasks because they are just tired of planning. Couples often choose not to make a seating chart, because it seems like too much work (more on that here). Another big decision that many couples often leave to chance is deciding whether or not to have an unplugged ceremony. Not sure what an “unplugged ceremony” is or if you should have one? Then you are in the right place! Keep reading. Technology is abundant in our world. I mean, come on, you are reading this right now on your phone (okay, maybe your computer or tablet, but the point still stands). We are by no means saying technology is bad or should be banned from your wedding but your wedding ceremony is sacred and should be treated as such. 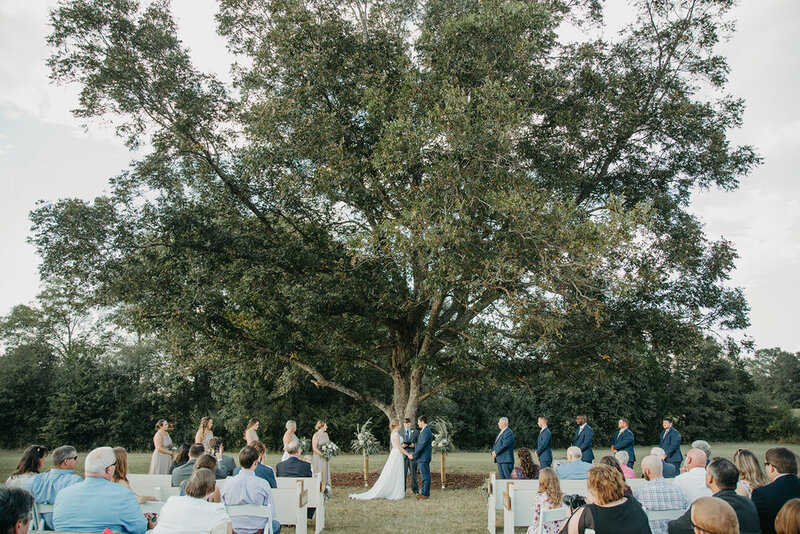 An unplugged ceremony simply means that you ask all of your guests to not use phones, cameras, or tablets for any purpose during your ceremony. That means no pictures, videos, or accidental phone calls. It seems pretty simple but it can make a world of difference. Not only is is respectful to the couple, it also looks so much better in the pictures and video your professional vendors will capture. Can you spot the cell phone in this picture? Once you have decided on an unplugged ceremony, the rest is simply deciding how you are going to let your guests know your of decision. There are a few ways you can do this. If you are using a wedding website then this is the perfect place to post a blurb about your unplugged ceremony. This way it gives guests plenty of time to plan and they can leave their cameras at home. A sign is never a bad idea! Make sure you place it at the entrance to your ceremony area so everyone can see. Right before the processional begins have your officiant announce that the ceremony is going to be unplugged and ask that all guests remain present and do not use cellphone or cameras for any purpose. Make sure they are specific about your request. Simply saying it is unplugged may not be enough. They need to state what you do (or do not want) very specifically. How do we suggest letting guests know that your ceremony is unplugged? Thanks for asking! We recommend doing all three of the above mentioned methods! It may seem like overkill but we promise it is not. People are more likely to miss the memo (or just ignore it) when they only see it once. By displaying it multiple ways, you are helping to ensure that everyone understands how serious you are. Allowing cellphone and cameras at your ceremony will not ruin your day but it certainly cannot hurt to ask all of your guests to experience the day with you and let the professionals do their job. How do you feel about unplugged ceremonies? Do you think it is too much extra work for just a 20 minute ceremony or are you 100% on board. Let us know in the comments below!